For the gifts listed in Isaiah 11:2–3, see Seven gifts of the Holy Spirit. For how Mormonism looks at spiritual gifts, see Gifts of the Spirit in Mormonism. Not to be confused with chrism. The term charism denotes any good gift that flows from God's benevolent love. A spiritual gift or charism (plural: charisms or charismata; in Greek singular: χάρισμα charism, plural: χαρίσματα charismata) is an endowment or extraordinary power given by the Holy Spirit. These are the supernatural graces which individual Christians need (and were needed in the days of the Apostles) to fulfill the mission of the Church. In the narrowest sense, it is a theological term for the extraordinary graces given to individual Christians for the good of others and is distinguished from the graces given for personal sanctification, such as the Seven Gifts of the Holy Spirit and the fruit of the Holy Spirit. These extraordinary spiritual gifts, often termed "charismatic gifts", are the word of wisdom, the word of knowledge, increased faith, the gifts of healing, the gift of miracles, prophecy, the discernment of spirits, diverse kinds of tongues, interpretation of tongues. To these are added the gifts of apostles, prophets, teachers, helps (connected to service of the poor and sick), and governments (or leadership ability) which are connected with certain offices in the Church. These gifts are given by the Holy Spirit to individuals, but their purpose is to build up the entire Church. They are described in the New Testament, primarily in 1 Corinthians 12, Romans 12, and Ephesians 4. 1 Peter 4 also touches on the spiritual gifts. The gifts are related to both seemingly "natural" abilities and seemingly more "miraculous" abilities, empowered by the Holy Spirit. The two major opposing theological positions on their nature is that they ceased long ago or that they continue (Cessationism versus Continuationism). The New Testament contains several lists of spiritual gifts, most authored by St. Paul. While each list is unique, there is overlap. In 1 Corinthians 12, two Greek terms are translated as "spiritual gifts". In verse 1, the word pneumatika ("spirituals" or "things of the Spirit") is used. In verse 4, charisma is used. This word is derived from the word charis, which means "grace". In verses 5 and 6, the words diakonia (translated "administrations", "ministries", or "service") and energemata ("operations" or "inworkings") are used in describing the nature of the spiritual gifts. In verse 7, the term "manifestation (phanerosis) of the Spirit" is used. It is generally acknowledged that Paul did not list all of the gifts of the Spirit, and many believe that there are as many gifts as there are needs in the body of Christ. The gifts have at times been organized into distinct categories based on their similarities and differences to other gifts. Some divide them into three categories using Old Testament offices. "Prophetic" gifts include any gift involving teaching, encouraging, or rebuking others. "Priestly" gifts include showing mercy and care for the needy or involve intercession before God. "Kingly" gifts are those involving church administration or government. Others categorize them into "gifts of knowledge" (word of wisdom, word of knowledge, distinguishing between spirits), "gifts of speech" (tongues, interpretation, prophecy), and "gifts of power" (faith, healing, miracles). The gifts have also been categorized as those that promote the inner growth of the church (apostle, prophecy, distinguishing between spirits, teaching, word of wisdom/knowledge, helps, and administration) and those that promote the church's outer development (faith, miracles, healing, tongues, interpretation of tongues). 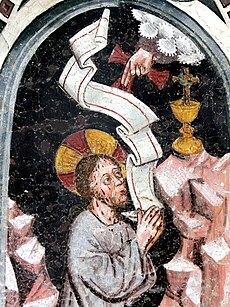 Proponents of cessationism distinguish between the "extraordinary", "miraculous", or "sign" gifts (such as prophecy, tongues, and healing) and the other gifts. Cessationism is held by some Protestants, especially from the Calvinist tradition, who believe that miraculous gifts and their operations were limited to early Christianity and "ceased" afterward. Other Protestants, including Lutheran, Methodist, Pentecostals and charismatics, adhere to the continuationist position, believing that all the spiritual gifts are distributed among Christians by the Holy Spirit and that they are normative in contemporary Christendom. In addition, Roman Catholicism and Eastern Orthodox Church also continue to believe in and make use of all of the spiritual gifts. Apostle: The title apostle comes from the Greek word apostolos which means "a messenger, one sent forth with orders". It refers to one who has been delegated authority by another in a foreign land. Apostles were the first leaders of the Church; they were commissioned by Jesus to initiate and direct the preaching of the gospel. While many Christians agree that the title of apostle is reserved for those among the first generation of Christians, many Christian denominations continue in one way or another to recognize a continuing apostolic ministry. Many churches, such as the Roman Catholic Church and the Eastern Orthodox Churches, believe in the doctrine of apostolic succession, which holds that properly ordained bishops are the successors to the apostles. Other Christian groups, such as classical Pentecostals, consider the role of a missionary to be fulfilling an apostolic ministry. There are some Christians, however, who advocate restoring the Fivefold ministry, including the formal recognition of the office of apostle. Others would say that the office no longer exists. Prophet: In the New Testament, the office of prophet is to equip the saints for the work of service through exhortation, edification, and consolation (1 Corinthians 12:28; 1 Corinthians 14:3 Ephesians 4:11). The prophet's corresponding gift is prophecy. Prophecy is "reporting something that God spontaneously brings to your mind". Many, particularly Pentecostals and charismatics, distinguish between the "office of prophet" and the "gift of prophecy", believing that a Christian can possess the gift of prophecy without holding the prophetic office. Service: The word translated as "ministry" is diakonia, which can also be translated "service". Since there are many types of ministries and service to the Church, this then describes a broad array of gifts rather than a single gift. Exhortation: The ability to motivate Christians "to patient endurance, brotherly love, and good works". Word of wisdom: An utterance or message of wisdom supernaturally granted to an individual. For Paul, wisdom refers to "the knowledge of the great Christian mysteries: the Incarnation, Passion, and Resurrection of Christ, and the indwelling in the believer of the Spirit of God (1 Corinthians 2; Ephesians 1:17)". Faith: This refers to that strong or special faith "which removes mountains, casts out devils (Matthew 17:19–20), and faces the most cruel martyrdom without flinching". It is distinguished from the "saving" and "normal" Christian faith. Gifts of healings: The ability to supernaturally minister healing to others. The plural indicates the variety of sickness healed and the many forms the gift takes, such as healing by anointing with oil, by the laying on of hands, by saying the name of Jesus or by the sign of the cross. Helps: This gift has to do with service to the sick and the poor. Possessor of this gift has a "spiritual burden and a God-given love for the needy and afflicted". Administration: Also called the gift of governing, the Greek word translated "governments" is kubernesis, the verb form of which means "to steer" or "to be a helmsman". This gift then refers to the God-given capacity to lead or guide the Church through storms and difficult seas. The word is also used in secular circumstances within social psychology. In that context, charism is defined as personal influence on other people individually or as a group. Religious orders (including Anglican, Catholic, Lutheran and Methodist) use the word "charism" to describe their spiritual orientation and any special characteristics of their mission or values that might be exhibited as a result of the vows that they have taken and the orientation of the order to which they belong. An example might be the works of a teaching order compared to that of a missionary order or one devoted to the care of the poor or the sick and those in need of help. ^ a b c d e f g h i j k l m n o p Wilhelm, Joseph (1908). "Charismata". The Catholic Encyclopedia. III. Robert Appleton Company. Retrieved 6 July 2010. ^ a b "Spiritual gifts". A Dictionary of the Bible by W. R. F. Browning. Oxford University Press Inc. Oxford Reference Online. Oxford University Press. Accessed 22 June 2011. ^ "charisma". The American Heritage Dictionary of the English Language (5th ed.). Boston: Houghton Mifflin Harcourt. 2014. ^ "Charismata". The Oxford Dictionary of the Christian Church. Ed F. L. Cross and E. A. Livingstone. Oxford University Press Inc. Oxford Reference Online. Oxford University Press. Accessed 22 June 2011. ^ a b Wayne Grudem, Systematic Theology: An Introduction to Biblical Doctrine (Zondervan, 1994): 1016–17. ^ Wayne Grudem, Systematic Theology: An Introduction to Biblical Doctrine (Zondervan, 1994): 1020. ^ a b Guy P. Duffield and Nathaniel M. Van Cleave, Foundations of Pentecostal Theology, 1983, (Los Angeles: Foursquare Media, 2008), pp. 332–33. ^ Duffield and Van Cleave, Foundations of Pentecostal Theology, p. 334. ^ Duffield and Van Cleave, Foundations of Pentecostal Theology, p. 335. ^ Grudem, Systematic Theology, p. 1021. ^ Easton, Matthew George. "Gifts, spiritual". Easton's Bible Dictionary. 1897. Accessed June 22, 2011. ^ Ruthven, Jon. On the Cessation of the Charismata: The Protestant Polemic on Post-Biblical Miracles Archived 2009-03-19 at the Wayback Machine. Deo Press, 1993, rev. 2008. pp. 3, 7. Accessed June 27, 2011. ^ "Spiritual Gifts Survey". Peace Lutheran Church. Archived from the original on 5 September 2012. Retrieved 11 March 2017. ^ "Spiritual Gifts". The United Methodist Church. Retrieved 11 March 2017. ^ Catechism of the Catholic Church 799–800 Archived 2011-10-19 at the Wayback Machine. ^ Duffield and Van Cleave, Foundations of Pentecostal Theology, p. 351. ^ Coppieters, Honoré (1907). "Apostles". The Catholic Encyclopedia. 1. Robert Appleton Company. Retrieved 22 June 2011. ^ Duffield and Van Cleave, Foundations of Pentecostal Theology, p. 353. ^ Grudem, Systematic Theology, p. 1031 note 21. ^ Duffield and Van Cleave, Foundations of Pentecostal Theology, pp. 353–54. ^ Grudem, Systematic Theology, p. 1024. ^ Duffield and Van Cleave, Foundations of Pentecostal Theology, pp. 339–40, 353–55. ^ "Paul and Spiritual Gifts: Reflections on 1 Corinthians 12-14". ^ Duffield and Van Cleave, Foundations of Pentecostal Theology, pp. 356–57. ^ Duffield and Van Cleave, Foundations of Pentecostal Theology, pp. 357–58. ^ a b Duffield and Van Cleave, Foundations of Pentecostal Theology, pp. 347–48. ^ a b Duffield and Van Cleave, Foundations of Pentecostal Theology, pp. 348–49. ^ a b Duffield and Van Cleave, Foundations of Pentecostal Theology, pp. 349–50. ^ Duffield and Van Cleave, Foundations of Pentecostal Theology, pp. 336–37. ^ Kavan, Heather (2013). "A psychodynamic interpretation of gender differences in descriptions of religious visions". The International Journal of Religion and Spirituality in Society. 2 (2): 77–87. ^ Duffield and Van Cleave, Foundations of Pentecostal Theology, pp. 340–41. ^ Duffield and Van Cleave, Foundations of Pentecostal Theology, p. 345. ^ a b Duffield and Van Cleave, Foundations of Pentecostal Theology, p. 343. ^ a b c d e Duffield and Van Cleave, Foundations of Pentecostal Theology, pp. 358–59. ^ Grudem, Systematic Theology, p. 1020. Grudem, Wayne A. (editor). Are Miraculous Gifts for Today? Zondervan, 1996. ISBN 978-0-310-20155-7. Four authors each provide four viewpoints concerning spiritual gifts: Cessationist, "Open But Cautious", Third Wave, and Pentecostal/Charismatic. Bullock, Warren D. When the Spirit Speaks: Making Sense Out of Tongues, Interpretation, and Prophecy. Gospel Publishing House, 2009. ISBN 0-88243-284-2. Deere, Jack. Surprised by the Power of the Spirit. Grand Rapids: Zondervan, 1993. ISBN 978-0-310-21127-3. Deere, Jack. Surprised by the Voice of God. Grand Rapids: Zondervan, 1996. ISBN 978-0-310-22558-4. Greig, Gary and Springer, Kevin (eds.). The Kingdom and the Power: Are Healing and the Spiritual Gifts Used By Jesus and the Early Church Meant for the Church Today? Ventura, CA: Gospel Light, 1993 (thorough and practical). ISBN 978-0-8307-1659-3. Hurst, Randy (editor). Divine Order: Leading the Public Use of Spiritual Gifts. Gospel Publishing House, 2009. Lim, David. "Spiritual Gifts" in Systematic Theology, A Pentecostal Perspective revised edition, edited by Stanley M. Horton. Springfield, MO: Logion Press, 1994. ISBN 0-88243-855-7. Wagner, C. Peter. Discover Your Spiritual Gifts: The Easy-To-Use, Self-Guided Questionnaire That Helps You Identify and Understand Your Various God-Given Spiritual Gifts, expanded edition. Regal, 2010. ISBN 978-0-8307-3678-2. Wimber, John and Springer, Kevin. Power Evangelism, revised and enlarged edition. Regal, 2009 (originally 1986). ISBN 978-0-8307-4796-2. This page was last edited on 16 March 2019, at 12:49 (UTC).